Seattle and Minneapolis – November 12, 2015: iPro, a mobile gaming technology company, has teamed with Sportradar, the leading provider of sports data services globally, to integrate the sports content firm’s industry leading NFL play-by-play data with its groundbreaking ringit! sports prediction mobile gaming platform. ringit! Pro, is now available for download on iOS and Android. ringit! challenges players to compete in real time, by predicting the next play, drive or gamewhile watching live football games. More than 15,000 pick options are available for players in every NFL game including predicting whether a team will run or pass next, the players involved, and the result of each play, as well as the ability to make prop picks or custom side selections. ringit! Pro is available now for social play (virtual coin). The ringit! sports prediction platform is powered by iPro’s exclusive, patented technology consisting of sophisticated algorithms which produce dynamic odds that constantly change throughout live games depending on what has happened, from game status to team tendencies, players on the field and more. In turn, the algorithms rely upon Sportradar’s comprehensive statistics, including official real-time scores, player statistics and the industry’s fastest play-by-play data feed. “Building a real time, play-by-play sports prediction platform is no easy task. Strong, fast, reliable game data is absolutely paramount to the ringit! experience, and Sportsradar is the first company capable of delivering. The result is an incredibly fun and unique gaming experience that hasn’t been possible until now,” said Robert Melendres, founder and CEO at iPro. “The Sportradar team was very enthusiastic about the opportunity to work with iPro. We believe their prediction games demonstrate the true power of our real-time data feeds like few other applications. Where else are sports fans challenged to make decisions in real-time, just like a head coach? 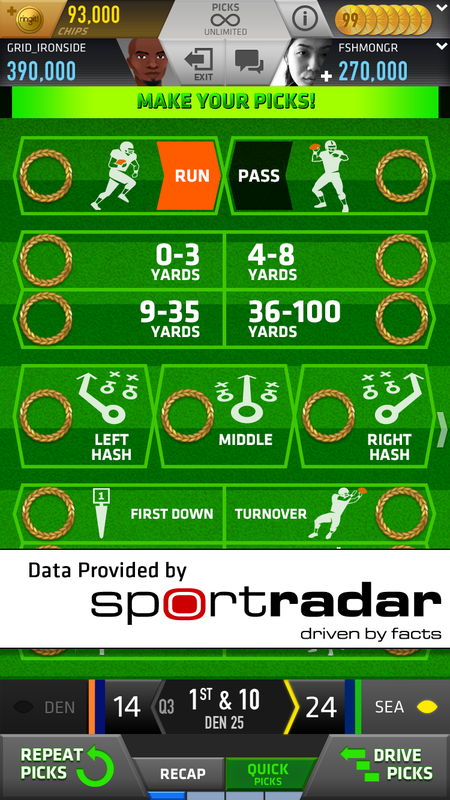 This is a very innovative app,“ said Tom Masterman, Chief Revenue Officer at Sportradar. Sportradar is the leading provider of sports data and information globally, covering over 325,000 live events across 48 sports. Sportradar has developed the industry’s most proficient software, distributing content and data that is easy to consume while setting new standards for speed and accuracy. Turner Media, Twitter and Samsung are among the leading companies in sports and digital media relying on Sportradar for innovative content, comprehensive applications and product development. Exclusive agreements with the NFL, NHL, International Tennis Federation and NASCAR are among its 65 worldwide league and federation partnerships. Sportradar’s U.S. Advisory Board includes Ted Leonsis, Mark Cuban and Michael Jordan. Learn more at www.sportradar.us. iPro is a mobile gaming technology company that develops new and innovative mobile prediction products that converge social, fantasy and sports betting game play into a single, seamless player experience. iPro’s first product, ringit! provides live NFL football competition anywhere and everywhere, expanding the way sports fans engage in the game and compete with each other via play-by-play, in-game predictions. Visit us at www.ringitgames.com, Facebook, or Twitter.